They are not a translation of the blogs in Dutch. Do you like to help to create a live Pong game with ‘Haagse makers’? Say you are 80 years old and look back on your live. What are the things you are really proud of? The things you did that made you grow. And the other side of the medal, thing not worth mentioning here. Things you had to say no, but you didn’t. 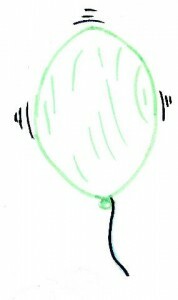 Because, it is a balloon, and yes it will burst. “Please pay attention to the numbers, the results have to go to your manager within 15 minutes,” says a computerized voice from his desktop. “If the rain is bothering you, I can play some music. Close the window and rebook your cottage.” “What?” Dave still isn’t used to this new computer system, it knows too much. 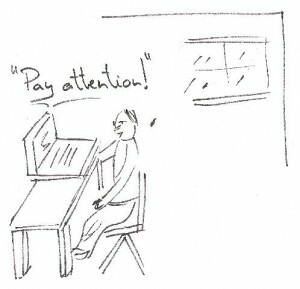 My Dutch blog of May the 4th is about computer systems being aware of their surroundings. And not only aware of their surroundings, but also being capable to act as and respond like intelligent people would do. Will it be possible in the near future or is it a fantasy film story? One of my readers provided a link to an article that tells: “Computers are knocking on the door of the company boardroom”. Graham Kendall who wrote this article concludes: “Technically it’s possible, but the costs to develop and maintain … probably means that it is not within the reach of most companies … at least for now”. However, Simon Wardley puts forward that business is nothing more than a catfight (5:26) He concludes that if some companies do get an advantage by use of new technology, others will follow soon or become irrelevant. Will it work? Will the computer be trusted enough by the other board members to get a real vote? The computer can access and evaluate far more data than any human being ever could do. Comparing all this data and calculating the most relevant answer is one step. To make the computers boardroom vote count, the other (human) board members should really understand how the computer came to its conclusion. In which way computers can convince humans? Partly, humans will trust computers more and more as their lives become depended on computer systems all along. Additionally, for the more complex and high risks decisions as in a boardroom, computer should be taught to present their results in a way that humans perceive their surroundings. Humans use metaphors to understand the world around them, as Lakoff and Johnson point out note in their book ‘Metaphors we live by’. Metaphors visualize a comparison of known and not known, bringing up some aspects and hiding others. This way we can understand things or situations we have not seen before. I give you an example which might be familiar if you have little children. Let us assume that the first animal Tessa encounters is a rabbit and she learns that it is called a rabbit. Then, if she sees a cat, she may refer to it as a rabbit with a tail. Over time she will learn that this new animal is a different type of animal, a cat. 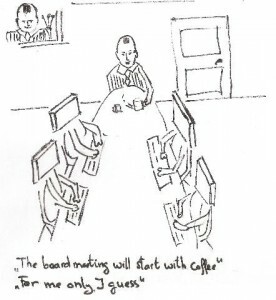 Consequently computers should visualize their results in accordance with the metaphors that would be understood by the other (human) board room members. However, for Dave this new computer system is like a nightmare; “it will know before me when I get sacked”. A famous story about some Blind men standing around an Elephant trying to guess what is in their midst. This metaphor implies that one’s subjective experience can be true. Only compared to others’ subjective experiences or the overall picture, it fails. It are not only blind men that have subjective experiences, we all do. In my professional life, it often occurs that I hear a story that makes me wonder why someone is claiming it as the truths. Only when I understand what the person’s viewpoint is, I can track down how that claim of truth was made. Business transformation is an ongoing process as John Smith notes in one of his articles that “Business strategies are not static and they constantly change as markets evolve, competitors act and new technologies emerge. So what we need is not just an ability to transform the business once, but to transform on an ongoing basis.” Creating a common picture of a desired change makes it possible to discuss business transformation. Why? Visualization will help us in our common understanding of that desired change. By having visualized that common understanding of our change, each of us can visualize their own representation of the common picture in their field of expertise. As we all know, people have different backgrounds and speak different professional languages, understanding each other is difficult. Visualization becomes a language that overcomes professional differences. It helps you to discuss our challenges and wishes with people who normally would not understand your professional language. In the debate we should try to understand each other’s viewpoints. Imagery or figurative language helps to create a common picture in our heads. That picture should reflect to each other’s professional background and supporting the common understanding of the change. 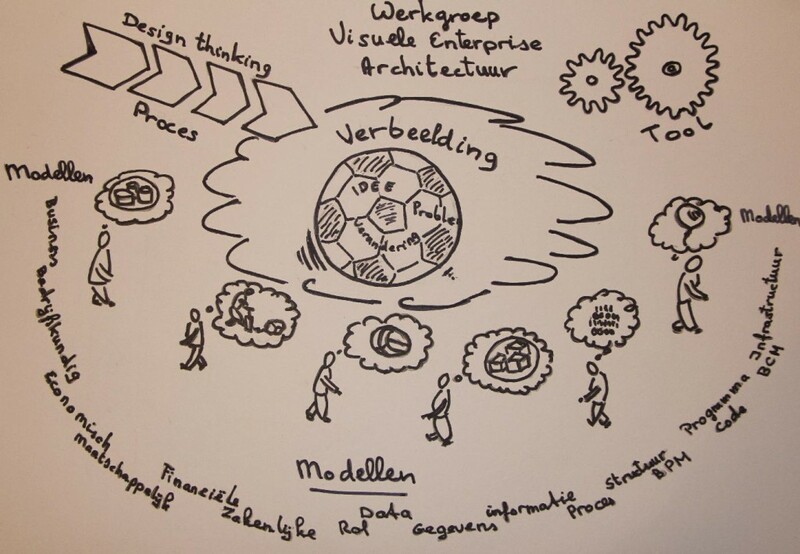 I visualized, in the drawing below, how the process of visualizing common understanding of a change works. 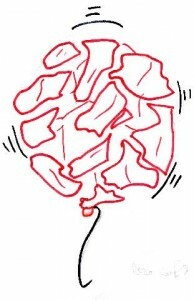 The drawing shows that everyone had its own representation of a ball. However, in the center of the drawing there is a common picture that makes communication between different specialists possible. For example: “we need to inflate the ball”. Each stakeholder can see for his own representation of the ball, how it can be inflated. 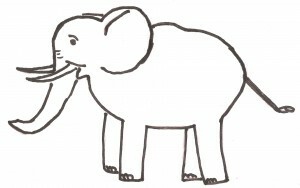 By putting together our subjective experiences of our own ‘Elephant’, we can see the whole picture of the business change and get to understand the other’s viewpoint of the change. What is my most important skill for success? The Court Jester and the King. “This will raise our expenses enormously”. “Do not exaggerate; think of the benefits of these new findings…” “We could expand our Kingdom”. The counselors squabbled on… The King became tired; it was already a long meeting. “Sing us a song, Jester and bring some light in these dark chambers or I’ll chop of your head”. The Jester thought of all conversations with the King and the counselors, the intrigues and conspiracies, he analyzed the situation… and start to sing. A song full of Mystic and strange words that gave all a vision on what had to come. It connected all the stories of the counselors and the King. They became aware of where they could improve and what to keep because it was good. Nevertheless the Jester spotted with the intrigues and conspiracies made them laugh…. Until the song stopped, all became quiet and looked at the King. The King did not look amused…, all looked at the Jesters head. The Jester had a humble smile on his face. The queen shouted “Hurray”… and the King started to smile. He made a firm decision, and all nodded their heads. Later in the corridor one of the counselors approached the jester: “You have an easy job, you walk and talk and sing and still the King and queen likes you. What do you do? I listen, replied the Jester.